I recently had a friend ask me a few questions about a ring I made not to long ago. They were specifically interested in how I achieved the purple coloration on the gold. As I began to address the question I realized that there was actually quite a bit I had to say on the subject and I thought it would make a great blog post... So here it is. . . An introduction to gold. Gold can be very confusing, there are so many color possibilities and the concept of karat/carat (K or kt) can be a bit tricky to fully understand. The best place to start is with karat (purity) and that will lead right into gold colors. 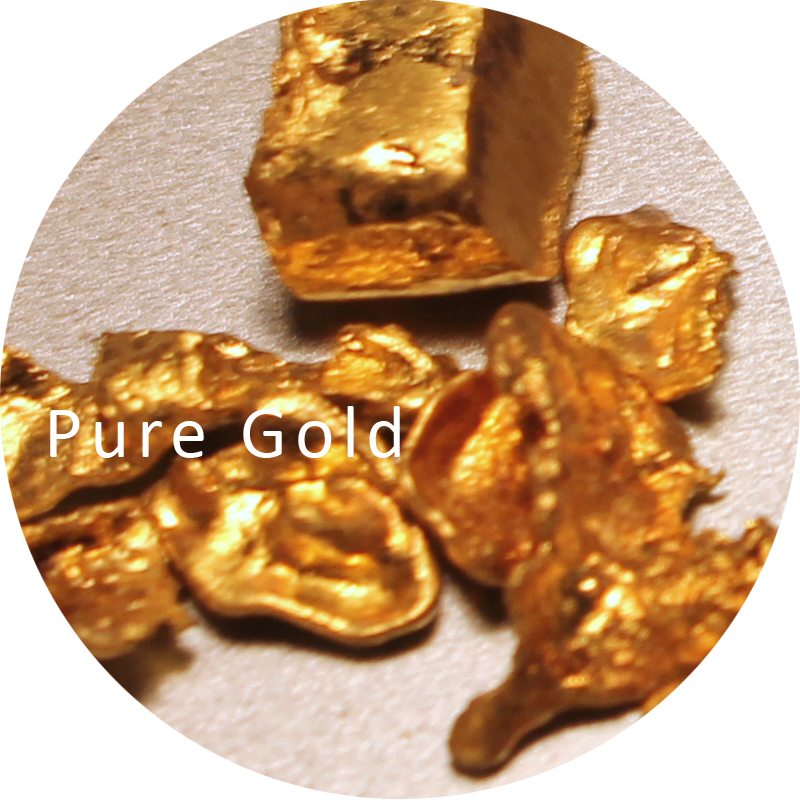 Gold purity is represented most commonly with a fractional system called "karat" which defines the proportion of gold present within an alloy (mixture of metals). This fractional system uses 24 as its base or denominator. Therefore 24K gold is "pure gold" and it is represented as follows: 24/24 = 1 or "100%". This is pretty straight forward and easy to understand if you know basic fractions. Lets look at what happens when we use something other than "100% gold". 18K gold is a nice place to start, it will give us easy numbers to work with. 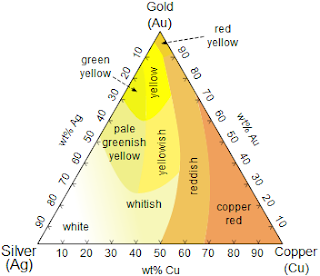 18K gold is represented as 18/24 = .75 or 75% gold and 25% "X" material/s. This is where things get tricky because the karat system only defines the proportion of gold (in math terms "the numerator"), but does not define the requirements for the remainder of the proportion to complete the ratio ("X"). In other words as long as 75% of the final alloy is gold it does not matter what the remaining 25% of the material is. It could be silver, copper, nickle, tin, zinc, cadmium, cobalt or any combination of whatever metal/s the manufacturer decides to use. It will always be 18K gold (if the proportions are correct). This is how many of the exotic gold colors are produced, by mixing different metals together to produce different colors and control/manipulate other characteristics of the material as well. Unfortunately this can also produce many allergies and other undesired effects. A great example of this is white gold, the traditional white gold alloy is produced by using only gold and nickel. Many people do not react well with nickel and it is also a difficult material to work with, so it is not an alloy I am particularly attracted to. However modern white gold alloys have found some alternatives to nickel. When I produce an 18K yellow gold, I use the following "recipe": 75% gold and 25% silver. This produces a very clean alloy. However the alloy of the material is only half of the story. 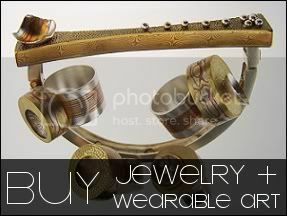 If you are looking at fabricated jewelery, we also have to consider the composition of the alloy being used as solder. Usually it is desirable to use a solder that is the same color as your base material. Unfortunately the easiest way to produce these types of solders is to take a small amount of the base alloy and add to it a little tin, zinc or other "white metal" to lower the melting point of the material. This will produce a new solder alloy which will be very close in color to the rest of the material, however the solder will also contain some potentially less desirable metals. 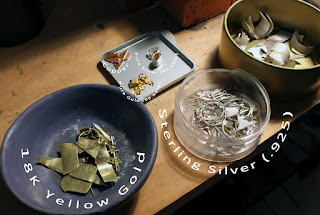 I like to work primarily with gold, silver and copper and prefer not to use "white metals" unless unavoidable. Particularly when working with gold I like to know what metals are in my alloys, and I like to keep the alloys as pure and clean as possible. I already shared my "recipe" for 18K yellow gold which produces a deep yellow. But how did I make the purple color on the ring? And what do I use for solder?In order to ensure I am not using any "white metals" in my gold pieces, I produce a special 12K gold alloy which has a low melting point that works as a great solder for any gold with a higher karat. 12K gold would be represented as 12/24 = .5 or 50% gold and 50% "X". 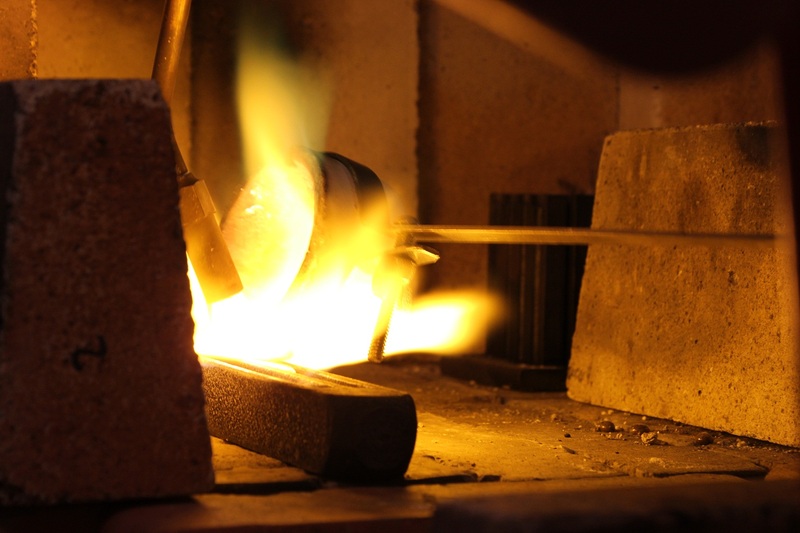 The formula I use to produce my 12K gold solder alloy is 50% gold, 25% silver and 25% copper. Material preparations. Re-casting sterling silver scraps, 18K yellow gold scraps, and preparing a12K gold alloy to use as gold solder (grey tray top middle). As I like to incorporate excess solder and natural coloration's/oxidation's into my work, I take advantage of the color variations that the different alloys produce and I exploit those characteristics to my advantage. Gold has very little reactivity and does not vary much from its bright yellow hue by itself. Silver and copper on the other hand react quite intensely to oxidation and can produce many different hues depending on how they are combined and/or treated. Since there will always be a drastic color difference in between my base material and the solder I choose to produce. I accentuate and exaggerate these color differences through patination (oxidation or "chemical treatment" of the metals). The chemical oxidation I use most often is a liver of sulfur patina which essentially darkens copper and silver to a black or grey. 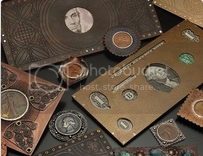 There are many different patinas capable of producing many dramatic effects and colors depending on the metal it was applied to and the method of application. An example of some of the possible color variations that can be produced on silver. 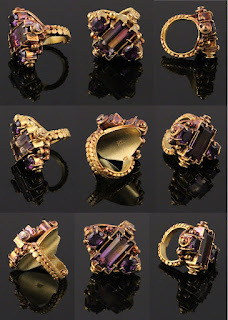 In these two rings (above, below) we can really appreciate how the copper within the alloy/solder produces a dark red, iridescent purple color which in the gold ring, match the colors of the stones perfectly. Part practice and part luck. Many times as an artist it is best to embrace the Bob Ross mentality of the "happy accident". To look at more rings, CLICK HERE. I hope you enjoyed this introduction to the perplexing world of gold. I will be back with more to share soon. In the mean time I would be happy to try and answer any questions anyone might have about gold.